Papergreat: 1907 postcard: "How is Maud and the cat since?" "April, 24, 1907; Dear Brother How did you get home, and what time was it. How is Maud and the cat since? Did you see anything of Nellie? Answer soon. Your Brother Oliver." Well, we'll certainly never know what that business involving Percy and Oliver was all about. 1. 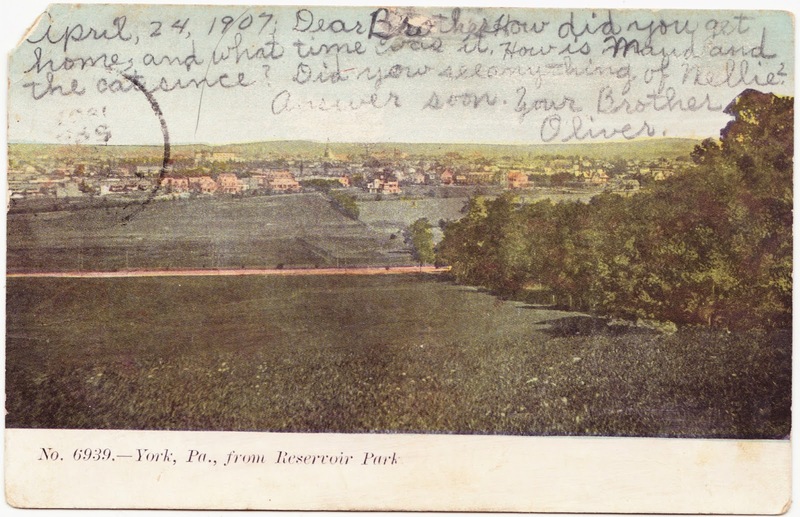 According to the online History of The York Water Company, Reservoir Park was opened in 1903. Bounded by Grantley Road and Country Club Road, it was "made available to the public as 'a public breathing spot' to relieve the stress and strain of modern life."